English, NB; Betancourt, J; Dean et al, JS (2001), “Strontium isotopes reveal distant sources of architectural timber in Chaco Canyon, New Mexico”, Proceedings of the National Academy of Sciences 58: 11891-11896, doi:10.1073/pnas.211305498 . Brugge, D; Hayes, A; Judge, W (1988), Archeological Surveys of Chaco Canyon, New Mexico, University of New Mexico Press, ISBN 0-82631-029-X . Canby, Tomas Y. (1982), “Anasazi,Riddles in the Ruins”, National Geographic 162:5, ISSN 0027-9358 . Diamond, J (2005), Collapse: How Societies Choose to Fail or Succeed, Viking, ISBN 0-670-03337-5 . Fagan, B (2005), Chaco Canyon: Archaeologists Explore the Lives of an Ancient Society, Oxford University Press, ISBN 0-19-517043-1 . Fagan, B (1998), From Black Land to Fifth Sun: The Science of Sacred Sites, Basic Books, ISBN 0-20-195991-7 . Frazier, K (2005), People of Chaco: A Canyon and Its Culture, Norton, ISBN 0-393-30496-5 . Hopkins, RL (2002), Hiking the Southwest's Geology: Four Corners Region, Mountaineers, ISBN 0-89886-856-4 . Kelley, DH; Milone, EF (2004), Exploring Ancient Skies: An Encyclopedic Survey of Archaeoastronomy, Springer, ISBN 0-38795-310-8 . 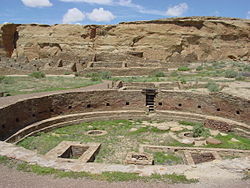 National Park Service (2005), United States World Heritage Periodic Report: Chaco Culture National Historical Park (Section II), http://www.nps.gov/oia/topics/CHCU.pdf . National Park Service (2007), Chaco Culture National Historical Park, http://www.nps.gov/chcu/ . Noble, D (1984), New Light on Chaco Canyon, School of American Research Press, ISBN 0-933452-10-1 . Noble, D (1991), Ancient Ruins of the Southwest: An Archaeological Guide, Northland, ISBN 0-87358-530-5 . Reynolds, A; Betancourt, J; Quade, J et al (2005), “87Sr/86Sr sourcing of ponderosa pine used in Anasazi Great House construction at Chaco Canyon, New Mexico”, Journal of Archaeological Science 32: 1061-1075, http://wwwpaztcn.wr.usgs.gov/julio_pdf/Reynolds_ea.pdf . Sofaer, A (1997), The Primary Architecture of the Chacoan Culture: A Cosmological Expression, University of New Mexico Press, http://www.solsticeproject.org/primarch.htm . Sofaer, A (1999), The Mystery of Chaco Canyon, South Carolina ETV . Strutin, M (1994), Chaco: A Cultural Legacy, Southwest Parks and Monuments Association, ISBN 1-877856-45-2 . Stuart, D (2000), Anasazi America, University of New Mexico Press, ISBN 0-826321-79-8 . Plog, S (1998), Ancient Peoples of the American Southwest, Thames and London, ISBN 0-500-27939-X .